Property 1: Lake Como, my family holidays! Relaxing and quiet place where to stay during your tour around Italian lakes. Property 12: Relaxing and quiet place where to stay during your tour around Italian lakes. 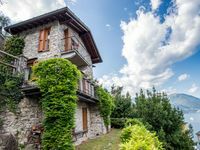 Property 13: Villa Liberty Giù, "Luxury villa on Lake Como"
The villa is located in Faggeto Lario which is 8km away from the center of Como! Property 26: The villa is located in Faggeto Lario which is 8km away from the center of Como! My husband and I stayed here for one week in early October. The owners were gracious and kind and the apartment was spotless. In addition, it was well appointed with everything we needed to make several evening meals and breakfast. It even had a washing machine and dishwasher. The WiFi was fast and reliable. The location was great for us because Nesso is very quiet and away from the crazy that is Como and Bellagio. And Nesso is on the ferry system. We loved the grotto down below and used it every night. There are a lot of stairs to get from the parking space to the apartment but we didn't mind. We have traveled extensively and have stayed at many self- catering apartments in Italy. This is our favorite and we would love to return.